This project is response to an assignment from Headmaster Magazine for Issue No. 8 centering on the Village People. I conducted a series of interviews with queers who had relocated to different cities to find out their reasons for moving and set out to analyze the results. 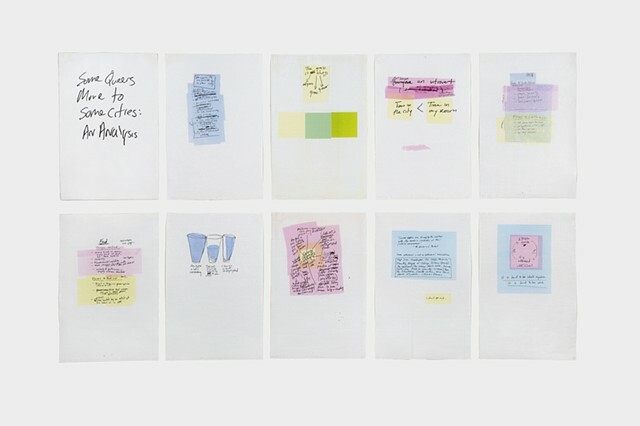 The resulting images form a thematic collection of semi-analytical lists, drawings and diagrams combining the different responses to different queernesses of folks with all different ages and identities living in different places. The prints were made using a color separation process and an antiquated color photocopier in the basement at Vermont Studio Center. The process involves laying different stencils on the copier. Color mixing is achieved by layering, similar to silkscreen printing, and each sheet is run through the copier multiple times.